"It is the policy of the State of Rhode Island that on land held in the public trust, no vegetation is to be removed for the purpose of increasing the visibility of any commercial property." Tar Heels familiar with a constitutional amendment known as the Environmental Bill of Rights (p. 538) know that was meant to do same for North Carolina, and they are bewildered that lawmakers, if even aware it exists, seem in flippant disregard. Many Republican lawmakers are oblivious, at best, to the opposition of 8-in-10 North Carolinians to cutting more trees for billboards including a ratio of 19-to-1 against among members of their party, revealing a glaring weakness in representative democracy. Obviously, taking out thousands of acres of roadside trees has an effect on public health because it is scientifically proven that trees help to clean the air, purify water, cool surface temperatures, screen wind and particulates and sequester climate warming gases. 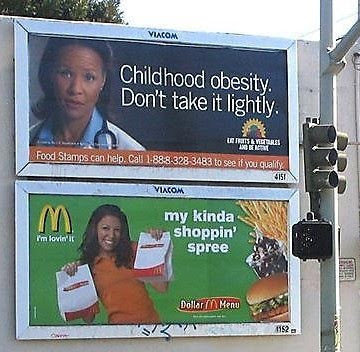 Now comes a new study revealing that the outdoor billboards for which they are being harvested are linked to obesity, where prevalent. This is a costly condition self-reported by 36% percent of Americans including 30% of North Carolinians. Is it possible that Rhode Island’s refusal to surrender roadside forests to billboards is part of the reason that state’s rate of obesity is lower than states such as North Carolina where lawmakers are gratuitously deforesting to make their views more effective? An analysis performed a few years ago by RTI International, based in Durham, North Carolina where I live, calculated that obesity is burdening the economy with hidden costs of more than $150 billion annually while jacking up health insurance premiums across the board. To put this “obesity” tax on the non-obese in perspective, it is nearly four times greater than the amount a House bill is intended to cut from the federal budget in hopes of pushing working American families off food stamps. They apparently think this will force these families to find work that pays a livable wage even though the proportion of low wage jobs has ballooned to 4-in-10, more than double what was in 2009. McDonalds touts environmental responsibility as one of its focus areas including “conserving and protecting natural resources.” Yet, for a decade, the world’s largest global foodservice retailer has also been the number one user of outdoor billboards. This makes that company a major enabler of deforestation by outdoor billboard companies along publically-owned roadsides, not to mention a company empowering visual blight in communities, where on average, restaurants depend on tourist appeal for a third of their revenue. Corporations like McDonalds have excellent intentions when it comes to sustainability, but all too often they are undermined when their marketing divisions fail to connect the dots or feel exempt. To be credible, marketing must be about “storydoing,” not just storytelling. One thing marketing departments in companies such as McDonalds can do immediately to redeem themselves is to stop enabling desecration by using outdoor billboard companies. Food and beverage businesses overall make up 1-in-4 of the top 100 businesses in terms of generating outdoor billboard revenue. In the past decade fast food restaurants alone have doubled their use of outdoor billboards while casual dining restaurants have pulled back. Just look at Cracker Barrel, which has touted using 1,500 billboards alone in the past but has now fallen from 5th to 14th place in use. Slowly, foodservice businesses such as Cracker Barrel are moving to far less destructive mediums such as highway exit logo wayfinding signs. Among fast food giants, only Wendy’s seems to have had second thoughts about billboard use. During this same decade, not counting those used by its bottlers, Coca-Cola, rose from 40th to 9th in billboard use contributing to a tripling of childhood obesity in a generation. Founded by a third generation restaurateur, Orlando-based Aaron Allen & Associates, a restaurant industry analyst and consultancy for both independent restaurants and chains, steers restaurants away from billboards and toward far more productive marketing vehicles. From 1971 when tobacco advertising on television was banned, until the early 1990s, tobacco companies were by far the largest users of outdoor billboards. Then, there too, tobacco encountered an uprising of public health considerations. It was in 1992 that McDonalds ran its first outdoor billboard campaign as tobacco advertising on roadsides fell dramatically by 33% by 1994 and then was banned from outdoor advertising in a legal settlement with 46 states in 1999 including North Carolina and Rhode Island. Leveraging fire-sale rates as the death knell for billboards grew louder, by 2002 McDonalds became the #1 user of outdoor billboards, keeping this obsolete advertising technology on life support, a standing the foodservice giant has retained into the current decade. This, even though studies show less than 1% of consumers now use billboards to make decisions and the desecration they create turns off 7 consumers for every 1 who still find them useful. Billboards are the bottom feeders of the advertising industry, which overall has fallen to where it now returns just 1/10th of its input in terms of what it costs to place. It is clear many lawmakers in North Carolina are not connecting the dots between billboards and public health. Or maybe special interest lobbying by billboard companies has made them tone deaf. Personally, I prefer to believe that most lawmakers are well-intended but just don’t get it or they are outmaneuvered by a sneaky few who know exactly what they are doing and don’t care. One thing is for certain, billboard companies operating in North Carolina are hollowing out the code of ethics of their own industry which calls for protection of children and respect for the environment. As for North Carolinians, we seem stunned if not numbed to the crass overreaching of billboard companies in the General Assembly. Or maybe we like most Americans have tuned out advertising to the extent we no longer notice the visual blight billboards create. Even more invisible and more deadly are the health hazards to which billboards contribute by enabling air and water pollution, increased erosion and surface temperatures and release of climate warming gases. My guess is that soon, public opinion will give a death sentence to outdoor billboards the same way it did to using them to advertise tobacco. In a Forbes article entitled No Billboards, No Outdoor Advertising? What Next?, Scott Goodson, the author of a blog and a book entitled Uprising, told of one such uprising that has happened already. In 2007, the world’s fourth-largest metropolis, São Paulo, Brazil put into effect a “Clean City Law” including an immediate ban on outdoor advertising as a form of “visual pollution,” even taking on media giant Clear Channel. In a matter of months São Paulo took down 15,000 billboards. Today, the measure retains an incredible 70% approval rating, coincidentially the same percentage of North Carolinians who see billboards as desecration. Businesses and residents alike in São Paulo have been suddenly and joyously exposed to the community’s rich sense of place. One day soon, North Carolina’s lawmakers too will rediscover the genius of the 1971 amendment to put roadside forests ahead of out-of-state billboard interests. It too will be be accompanied by a rediscovery of the state’s unique sense of place and a gestalt on the part of business.